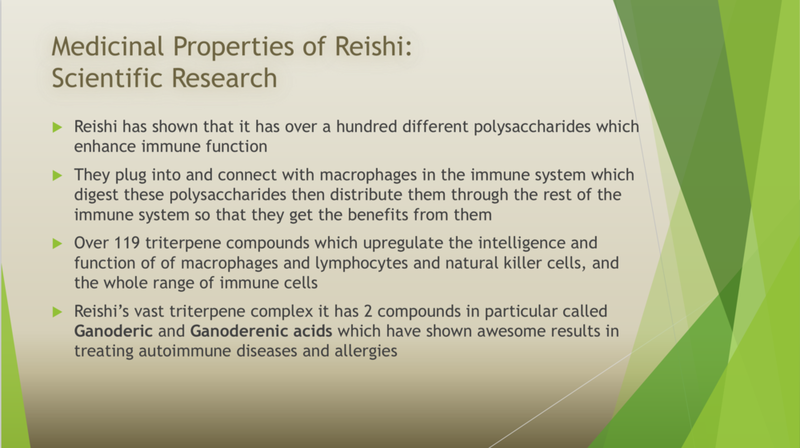 "Medicinal Properties of Reishi & An Experiment in Growing and Using Reishi Mushrooms for Immunity"
During this presentation I also explained that part of my final will be to experiment with growing Reishi mushrooms on my own. I ordered a kit, and plan to start it in May after this semester ends. I also explained how I used to get bronchitis every year my whole life, and that since using mushroom immunity pills (which include a variety of mushrooms as well as Reishi) for maintenance, I haven't gotten bronchitis in 3 years. 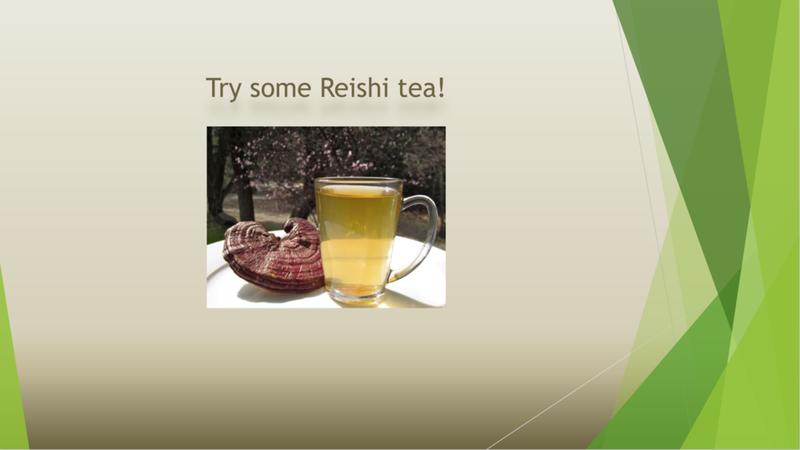 I would like to start regularly using and processing dried whole Reishi mushrooms in tea or tincture form (eventually incorporating in the Reishi that I grow myself) to use every day instead of taking the mushroom immunity pills for daily maintenance. Overall I think it will be cheaper and more sustainable to incorporate into a daily routine. I am continuing to try to spore my mycelium experiment from class, though it appears to be stuck where it was. The spores are not spreading beyond the middle layer of the tupperware container I chose to house it in. I allowed more oxygen in but no further growth has appeared. 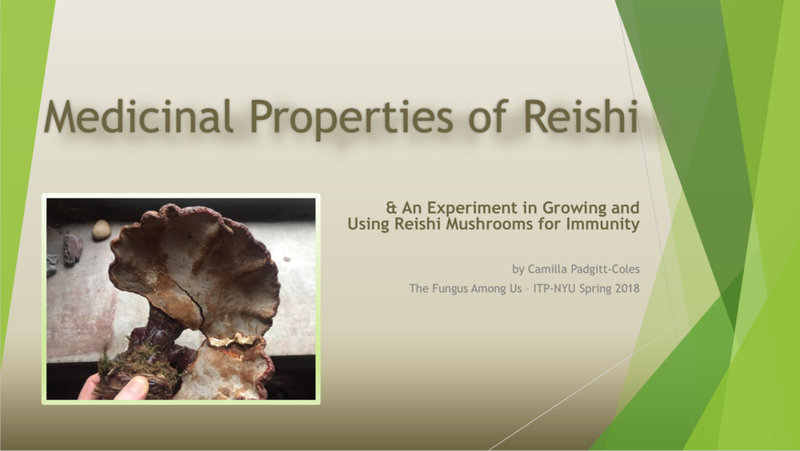 I was definitely inspired to also make an art object inspired by it but focusing on Reishi seemed to be closer to my heart for this project, and I most likely would not have thought of trying to grow my own if it were not for this class and our experience with growing mycelium. I think if I had focused on an art object I would have perhaps turned my piece into a plant holder or something practical that could live in my home to remind me of mycelium and its ways. However I think the readings and work in this class has solidified that I will be thinking about mycelium in relation to many things from now on. "We face the possibility of being rejected by the biosphere as a virulent organism. But if we act as a responsible species, nature will not evict us." I think it is particularly interesting to think of the human race as a "virulent organism" that could be ejected from the planet if we do not reform. We have a lot to learn from mycelium and its way of integrating with and supporting the natural and healthily codependent cycles of life on Earth. The idea of "Biotech" is interesting to me because it unites us again with the natural source of many answers to health concerns (in tandem with nurturing and preserving that source), which the pharmaceutical industry has led us far from. The relationship between the mycelium's network and nature is highly symbiotic, and caring for the whole. It seems to be a network of non-hierarchy, where the health of the entire system is paramount. Knowing that we are related to fungi in some way makes it easier to see how we too could benefit from creating a non-hierarchical system where we collectively reform our ways to preserve the planet and ourselves as part of it as a whole. It seems that mycelium have also survived many of Earth's species' extinctions and disasters, so there is definitely something for us to learn from there. In fact, it seems the very fabric of the universe very much mirrors a mycological network, which is also apparent in the workings of our own brains, and the internet, our invention which mirrors all of the above. In a way the internet also seems like it could create this nonhierarchical access, depending on how we choose to use it. Seeing mycelium as our "allies" is a deeply moving idea, and their intelligence feels quite mysterious but also fundamental to the workings of both our human brains and the workings of all life on Earth as well as in space itself. So if we can see our brains as also tapping into the greater good of something greater than ourselves, i.e. this mysterious "whole", then maybe we can be a bit more like fungi. The term "Astrobiology" is fascinating to me. If we can extend our consciousness out from ourselves, and Earth, to the Universe, maybe feeling very small in context of it all (and also mycelium's role in life possibly on other planets or in space), and also how we must be careful not to inoculate unnecessarily outside of our biosphere, of would be humbling and have a positive effect on us as a species and our perception of our role in at all, and duties to both thrive/survive and support and not disrupt the helping and inter-dependent relationships between nature and ourselves, and even outer space. The arrangement of "matterenergy" (also just learned this term) in the universe, strings which conserve energy and resemble mycelium, which resembles the internet, brings us back to Paul Stamet's theory that the internet is an archetype rooted in this mycelium-like form which natural networks take. Stamets often underlines that our salvation as a planet and species will be to make like a mushroom and become more integrated in a nonhierarchical web of life, mirroring by the interdependence inherent in fungus intelligence and working with, supporting and becoming allies with both actual "mushroom medicine" as well as with the deep wisdom and metaphysical teachings of mycelium. "The interconnectedness of life is an obvious truth that we ignore at our peril." Working title: "Medicinal Properties of Mushrooms & Their Effects on the Health of Humans and the Biosphere"
For our final project I would to focus on the medicinal properties of mushrooms. 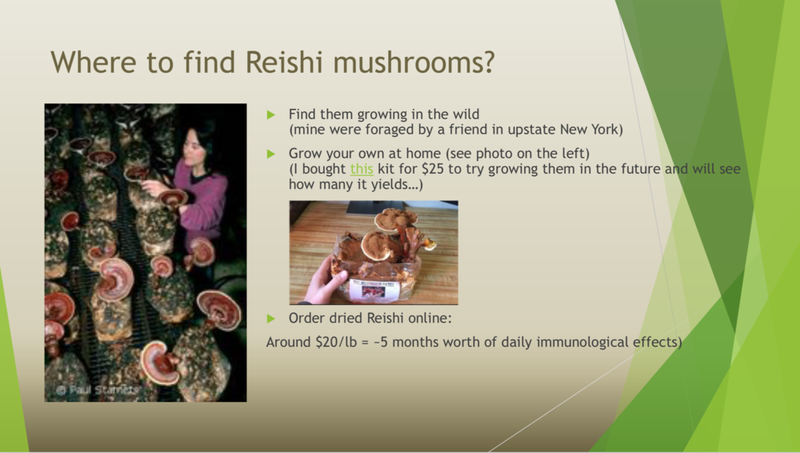 I will outline different types of commonly used medicinal mushrooms (Reishi, Chaga, Shiitake, Maitake, Turkey Tail, etc.) and their individual benefits, and talk about how they are used in boosting the immune system in humans, and possibly even proven to be able to shrink tumors or treat cancer, etc. and provide a basic overview of how that relationship with the human body works. I would also like to touch upon Paul Stamets' theory on mycelium's role in increasing immunity in bees and the impact this could have in preserving our planet's ecosystem as we know it. This could also lead to drawing a greater conclusion or parallel about "mushroom medicine" as a remedy for the state of the planet as a whole, and how mycelium works similarly in nature (an analog between the human body and nature itself). 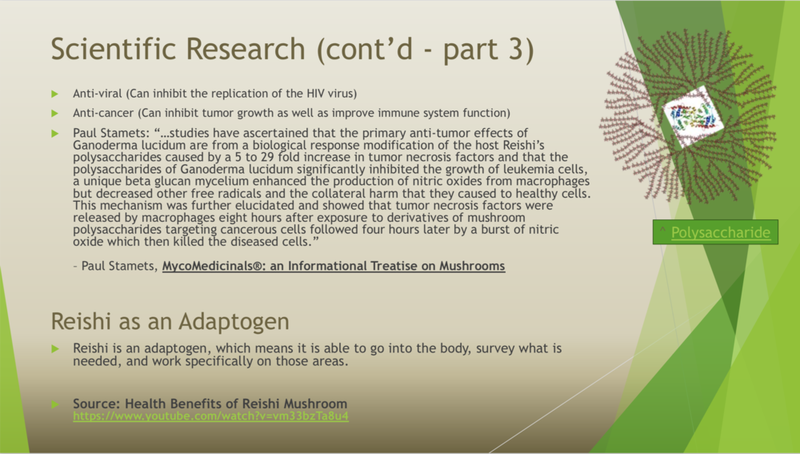 I will be using the readings and videos assigned from our class as well as the E-Book "Medicinal Mushrooms: Following the Natural Path to Boosting Your Immunity, Energy and Overall Health".